Harper Row is a very nice girl. She doesn't swear, or curse, or yell. I once heard her raise her voice. But that was because she had no choice. As Batman was watching the sit-com, 'My Name is Earl'. Or then again, maybe it was something else created by Writer: John Layman; Artist: Scot Eaton; and Publisher: DC Comics, in May, 2013. Using GENERAL terms, answer the following 5 questions about this STORY entitled 'Shadows and Ghosts'. WHAT'S THE MAIN THRUST OF THIS TALE: Batman tries his best to prevent a foreign dignitary from getting killed on his home turf -- Gotham City. ARE THE MAIN OBJECTIVES ACHIEVED: Yeah. I'd say they were. Thanks to Harper Row throwing some light onto this very intense situation. ANYTHING ELSE HAPPEN: We get to learn how one of Bruce Wayne's lovers, Mio, turns from a sweet and innocent girl, to a super powered assassin that wants to kill a foreign dignitary. HOW DOES THIS STORY END: With a man in a pointed beard speaking in cliché, and with Bruce Wayne himself doing what he does best. Brooding. WHAT'S THE BACK-UP FEATURE ABOUT: Kirk Langstrom investigates if his other half -- Man-Bat, not Francine -- is killing people under his very nose. ...referring to his current relationship with his wife. Very sad that, isn't it? Plus kind of maudlin in tone too. (+) Even though I wasn't too thrilled by the way that the main tale was executed, I did like the overall concept behind it. To me, personally, a story about one of Bruce Wayne's past-lovers coming back to cause mischief, is a very engrossing premise to riff off of. Shame that it never come over in the same manner though. A bloody shame. (+) I like Harper Row as a character. Truthfully, I do. I just wasn't blown away by her appearance in this issue, is all! She just turned up. Got in the way. Helped out. And then absolved herself in hindsight. Not that this is a bad thing of course. It's just not a great-great thing either. (+) The Man-Bat back-up feature was a very nice and poignant tale. It relayed a great story. It was drawn brilliantly by Andy Clark. And to be absolutely honest about with you, I enjoyed it a lot more than the main-feature in itself. (+) That has to be Ra Al Ghul at the end of this yarn! I can hardly wait to see what this git has in store us. I just hope that it's... errr... no... I leave that for my concussion. Hahahah! (-) I've never been too keen on superhumans showing-up on a Bat-book myself, as this type of thing kind of breaks up the urban nature of this title, making it come across a bit hooey by default. What a shame. As Mio seemed like a nice character to begin with. 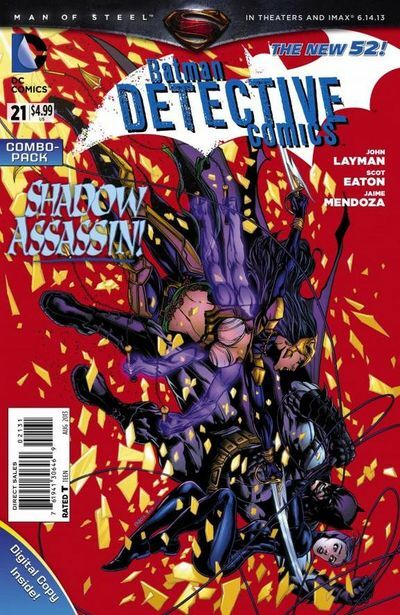 (-) Was it just me, or was there an awful lot of purple in this issue? I mean, does DC have a purple quota to fill this month? Cramming it all into one book! 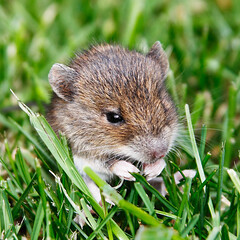 A FIELD MOUSE AS HARPER ROW: Now if you squint your eyes real tight, tilt your head sideways, and take plenty of drugs, you'd have a pretty good idea where I'm going with this comparison. A PSEUDOCHROMIS AS MIO: Not only do they both share a similar colour pallet -- purple and yellow -- but this fish and this assassin have had an affair with a young Bruce Wayne. 'WOMAN A PROBLEM' BY STEVE NIGHT: Aesthetically, this yarn is about the problems Batman has with two women in his life, and that is why this song and this story are a perfect match. High Five! In an attempt to take over Gotham City, Ra's suddenly opens up a reasonably priced fast-food restaurant on every street corner. After a rather hectic drinking session he has with Lindsay Lohan and Charlie Sheen, old Ghul face tries to usurp the Wayne Empire by calling Bruce a lot of naughty names in public. Ra's shaves off his pointed beard, and uses it to clone another version of himself. One made of rubber. Ra's reveals to Bruce a love affair he once had with Alfred Pennyworth during the sixties, thus shaming him into submission. For no good reason what so ever, Ra's decides to form his own comic book company, and destroys Batman's good name by rebooting his series seventy years down the line. OK. I best stop myself there. As I don't want you to get the wrong impression of me, dear reader, Blu-Blu-Blu! All I have left to say is that this wasn't a bad issue overall. The art was great. The back-up feature was smashing. And it was only really let down because too many concepts were juggled and not caught. Still, nevermind, huh? Better luck next time John and company. Fingers crossed. GIVE IT, IT'S DUES: If This Comic Book Was a Milkshake, It Would Be a Blueberry Milkshake Because It Looks Purple and Tastes Sweet.